Located in Santa Barbara County on the central coast of California, the city of Santa Barbara is one of the most popular and truly picturesque coastal spots in all of the Golden State. California is home to a whole lot of amazing coastal cities, but the unique charms, stunning Mediterranean-style climate and architecture, breathtaking mountain and ocean views, and wonderful beaches of Santa Barbara really make it stand out as one of the best. Home to around 92,000 people, this city has a history dating all the way back to the late 18th century when the Santa Barbara Mission was established. It still stands to this day as one of the city's most emblematic buildings and most popular touristic hotspots. Other key locations around the city include the Presidio of Santa Barbara, the Santa Barbara County Courthouse, the Santa Barbara Zoo, and the amazing Stearns Wharf shopping and dining waterfront area. It's a wonderful city with an especially Spanish flair and style that has helped to earn it the nickname 'American Riviera' and make it a great resort location and a super spot to spend some time at any period of the year, but especially in the spring and summer when the weather is at its warmest and sunniest. If you're heading down to Santa Barbara, one of the best ways to make the most of your trip is to stay in a hostel. There are several good hostels around Santa Barbara offering low cost accommodation, useful amenities, and communal spaces to help you meet and share ideas with other travelers, perhaps even making some new friends and forging some new bonds along the way. Read on to learn all about the top hostels in Santa Barbara. There aren't too many hostels in the Santa Barbara area, with many visitors to Santa Barbara choosing to stay a little outside the city and travel in each day instead, but if you want to be right in the heart of Santa Barbara, free to roam the city streets and explore the various landmarks and attractions, the IHSP Santa Barbara is a great hostel to choose. This is one of the only hostels to be located right in the center of Santa Barbara itself, and the location of this hostel is definitely one of its strongest aspects. The IHSP Santa Barbara is just a minute away from a bus stop to help you get around town. It's also within walking distance of key locations like East Beach and Stearns Wharf, with the Santa Barbara Zoo also only a short journey away and the shops, bars, and eateries of downtown also only 5 minutes away by car or around 15 by foot. This hostel is a relaxed and cozy location on a quiet, residential street. You'll be able to get a good night's sleep here and can also meet other travelers in the Santa Barbara area in the various communal areas like the rooftop terrace, TV lounge, and kitchen. Free breakfast is provided to all guests too and the staff here are super friendly and always ready to share tips and advice for getting around the local area and making the most of your stay in Santa Barbara. If you don't mind staying a little outside of Santa Barbara and traveling into the city each day, the Melrose Hostel in Los Angeles could be a good option for you. This hostel offers really low priced rooms, with its affordability definitely being one of its strongest selling points. For people traveling on a budget or those who simply want to cut down the costs of their Santa Barbara trip, Melrose Hostel is a nice option. This hostel is actually located in the Hollywood area of LA, so it's close by to several major attractions like the famous Chinese Theatre and the Hollywood Walk of Fame, and you can get taxis, ride shares, and various forms of public transport to head along the coast and into Santa Barbara whenever you need to. It's a good hostel to choose if you want to see Santa Barbara but would also like to explore the various neighborhoods and areas of LA like Venice and Hollywood itself. The Melrose Hostel offers brightly colored dorms with bunk beds and simple amenities. 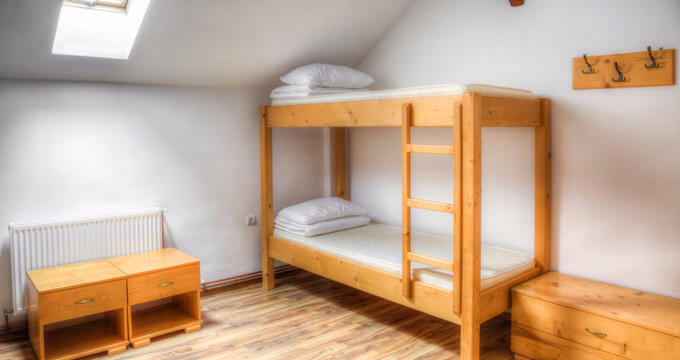 The bed linen is always clean and cozy and the dorms are quite spacious so you don't feel too cramped, despite the fact that you can find up to four bunk beds per room. Along with the dorms themselves, this hostel also offers free breakfast for all guests and some communal spaces like an outdoor terrace and a large lounge. Like Melrose Hostel, the Hostel Obispo isn't actually located in Santa Barbara, but it does still offer a lot of reasons to stay and can provide relatively quick and easy access to Santa Barbara for travelers. This is a really clean and cozy hotel located on a quiet residential street in San Luis Obispo, a coastal city just a little further along the Pacific Highway from Santa Barbara. It's a beautiful city with a lot to offer like the Mission San Luis Obispo de Tolosa, the fascinating Bubblegum Alley, and the historic Fremont Theater. There's plenty to do in the local area around Hostel Obispo and you can use public transport or ride shares to get into Santa Barbara with ease. The local streets of San Luis Obispo offer plenty of good bars, restaurants, and shops to explore and enjoy as well, with the Mission and Bubblegum Alley within walking distance. A laid-back hostel that has been lovingly furnished and decorated to a very high standard, the Hostel Obispo is one of the top places to stay for Santa Barbara and San Luis Obispo visitors. It features a spacious communal kitchen and lounge, a small outdoor terrace area, beautiful bathrooms, large and comfortable beds, laundry machines to keep all your clothes clean and dry, and much more.